No doubt, among our readers we have quite a few costume enthusiasts. Well, those readers may want to settle in on their fainting couches because the "Lady Victoria" boot from Poetic Licence is seriously costumey. Some people are very against the idea of looking too period lest you be costumey, but we think it's just fine. 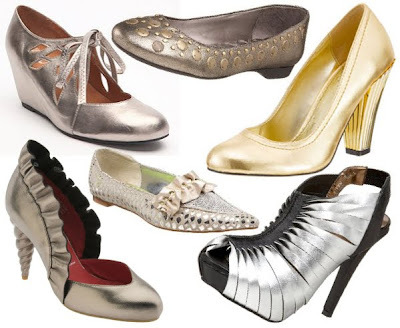 And accessories like shoes and jewelry are a fun way to tinge an outfit with your personality when the occasion is otherwise more sartorially conservative. However, I think the black and cream versions of these boots are fugly as all get out. (Getting out is quite fugly.) I just can't see them going with anything. The brown, maybe. Even so, the height of the boot is awkward and I can't help but think about how dirty they'd get after of few days in sidewalk-free Indiana. Do you like them? If so, what would you wear them with? They're gorgeous but impractical. I would have to seriously think about what to wear them with. A short skirt to show them off? A long skirt to make them more subtle and less costume-y? You'd have to choose carefully. 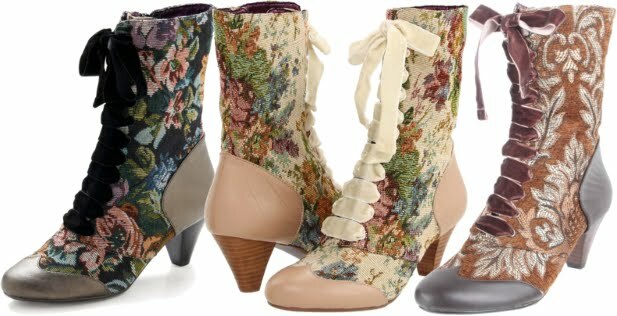 I mostly love them but they would go with nothing wear... i'd rather make the tapestry spats to wear over normal shoes. I don't think they're costumey. As with most of my vintage-esque items, I would probably be super conservative with everything else. So, for example, with the dark green-based ones, I would probably wear them with a green sweater, gray or black knee-length skirt, and gray or black tights, so the shoes are really the only crazy thing I'd be wearing. 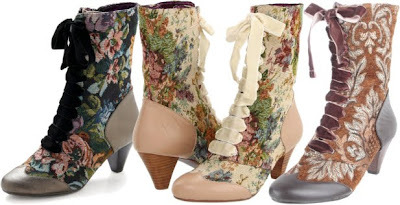 These quaintrelle boots are simply exquisite! They are absolutely gorgeous and very, very comfortable. The lighter ones do tend to look a bit "Alice in Wonderlandish", but that may be one of the reasons I find them so delightful. 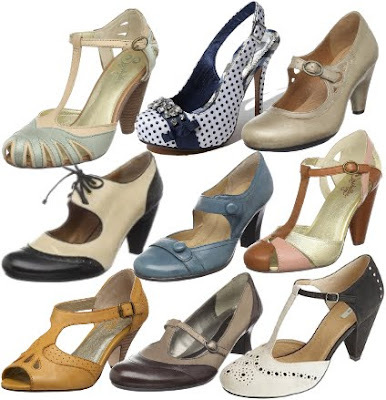 I have worn them with long skirts, short skirts, even a ripped up pair of jeans, and they look fabulous. One complaint though...after wearing them twice, the flimsy sole separated and I had to bring them to a shoe repair. Other than the sole, they are quite well made are are definitely one of my fave's.